1/2 kg hand ground mince -you can use meat as per your choice mutton, beef or lamb. Grind the ingredients in list A to a paste and keep aside. Blend the ingredients in list B in a bowl and keep aside. Heat oil in a thick bottom pan add onion and fry till golden brown. Add mince and fry it well, stirring continuously, breaking any lumps if formed. Add the ground paste and salt, saute well and cook it covered till it is almost done. Now mix in the yogurt mixture, stir well and cook for another 5-6 minutes. 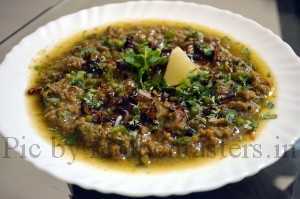 Serve hot garnished with fried onions, coriander leaves and lemon wedges.